At noon, I entered a church around the corner that was about to be auctioned. The building was small – a sanctuary, bathrooms, a couple of closets, a small fellowship room, kitchenette and what could be used an office. According to websites, the starting bid was around $100,000. As I looked around the building, I noticed hymnals still in the pews. A floral arrangement decorated the front of the church. Tracts expressing a theology that seemed foreign to me were stacked in a wall display. Fliers still hung on bulletin boards. It was a “ghost church” – a church that was once alive but now was a merely a shell which no longer held life and energy. It was sad to enter this church and look around at the pulpit knowing a pastor had preached his last sermon there, people were baptized in their pool behind the pulpit and that dreams of a new ministry may have dwindled. But I didn’t know their stories. Besides seeing the church’s Facebook page which hadn’t been updated since January 29 of this year, little was available about the recent life of the church. I overheard the realtor handling the auction saying that no other churches had come forward as interested in purchasing the building and property. So I asked him a little more about this. He said that for some churches who were growing, this was not an ideal space – too small. It sounded like churches were looking for spaces that tapped into their potential. After my tour around the building, I left before the auction itself could take place. Because of my departure, I never heard what had happened during the auction, if anyone bid or who would be moving into the former church. This is another piece of the larger picture of churches and buildings. 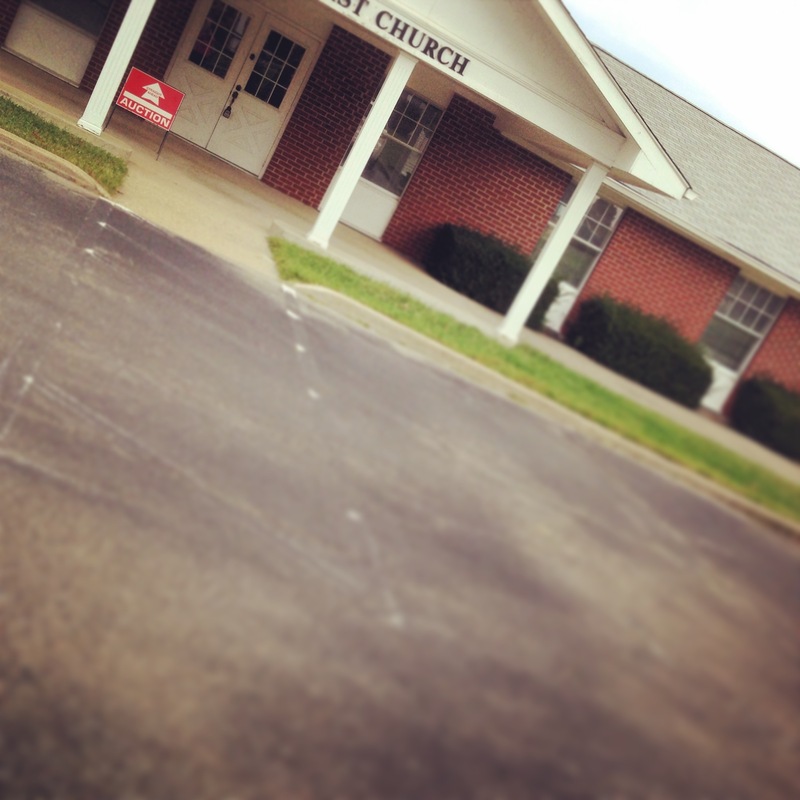 What are some recent churches you know that have moved from their building as their membership drastically changed? How were their buildings no longer serving their mission, vision and purpose? How much did it take for the congregation to arrive at the decision that the building no longer fit their identity or who God was calling them to be? And how much grieving did each of these churches need to endure when leaving behind this concrete part of their past while moving into the future courageously and with the wisdom of God? When families grow, they purchase a home that fits their growing family. When a couple are empty nesters, they will often sell their house to move to something smaller. When a person is no longer able to climb the stairs in their homes, they move into a home which accommodates their accessibility. When our finances change, we move to residences that we can afford. So why aren’t the reasons a congregation possesses or releases a church building similar to the reasons an individual or family buys and sells a house or condominium? While we are attached to our homes, I believe we are more attached to our church buildings. These are the places where the highest and lowest moments of our lives occur: weddings, funerals, baptisms, confirmations, etc. The reason we keep a building is not often practical or even spiritual but emotional. How do we transform our way of thinking so that churches look at church buildings as a means of doing ministry rather than our greatest achievement and acquisition of ministry? A good article on how churches can become places of emotional tie rather than suitable as a centre for ministry.